A year ago today I brought Alex home. He was ten weeks old. The night before I picked him up, I could hardly sleep, wondering what I was getting into. But it’s been a wonderful experience to watch him grow up and see his personality develop. He’s turning into a wonderful companion. I’m thankful that he and Emily were together before she passed away in February. It feels like a passing of the torch. May we have many happy and healthy years together. During the summer the town of Marshall, NC, a small town on the French Broad River, hosts French Broad Fridays once a month. Shops, artist studios, and galleries are open late and the main street is filled with pedestrians, kids on skateboards and bikes, and dogs on leashes as the town turns out for a night of festivities. 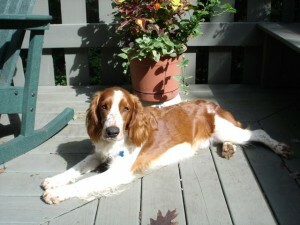 Each month the evening’s events have a different theme, and this past Friday it was Dog Daze. Activities included paint your own dog dish in a pottery studio, open house at Friends of Madison County Animals, and Pet-i-cures at a nail salon. The highlight of the evening was the dog contests, with prizes for the largest dog (won easily by a harlequin great dane), smallest dog (a yorkie mix), best trick, best costume, dog/owner look alike, and dog with the longest tail. After deliberating between the great dane and a daschund, the judges decided that the criteria would be “longest tail relative to size of dog.” In the end, both received a prize. 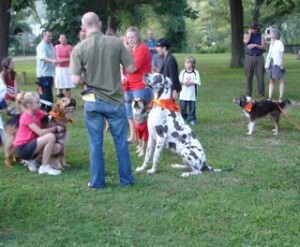 the Great Dane wins the largest dog contest. After the contests, the dogs paraded through downtown Marshall. Small town fun, kids and dogs, and a perfect summer evening.